As mentioned earlier this week in the post “End of an AERA“, Ontario was well represented at this year’s American Educational Research Association (AERA) annual meeting. Using this year’s program (“2011 Annual Meeting Program” ISSN 0163-9676) it was possible to identify Ontario researchers according to their listed organizational affiliations. Over the course of this 5 day event there were 177 presentations (papers, symposia or posters) delivered by researchers from Universities, the Ministry of Education and District School Boards from Ontario. One notable feature of the AERA program is that each presentation has been categorized according to a theme or topic. This is incredibly useful when you consider how many presentations are listed in the program. AERA attendees used these themes to plan their days according to their areas of interests. 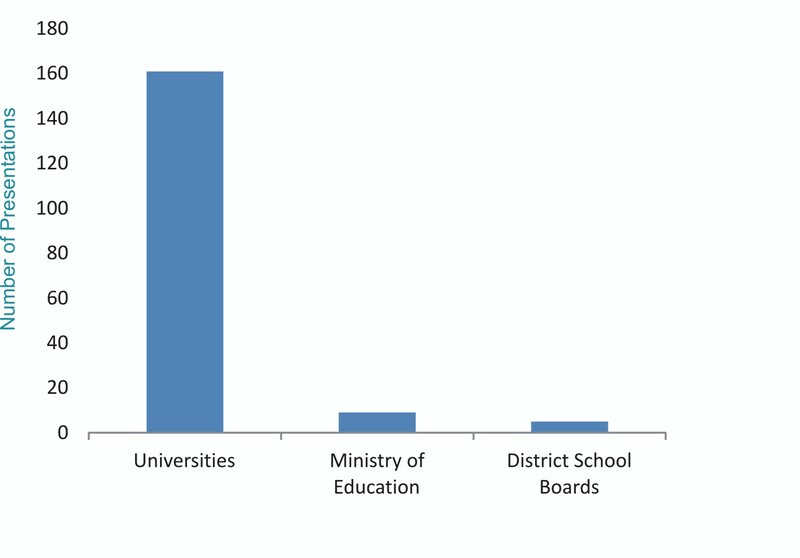 Although the majority of the presentations featured University research (161) , research was also presented by the Ontario Ministry of Education (9) and Ontario District School Boards (5) . A complete list of topics, titles and presenters is too long to include in a single post but is available here as a Google doc to anyone who is interested in exploring the Ontario research featured at AERA 2011. This list not only provides insight into the current topical trends in Ontario Education Research but also highlights the variety of research that makes it Top TIER. This entry was posted in Top-TIER and tagged AERA, Education Research, Google Doc, Knowledge Mobilization, Ontario, Summary. Bookmark the permalink.